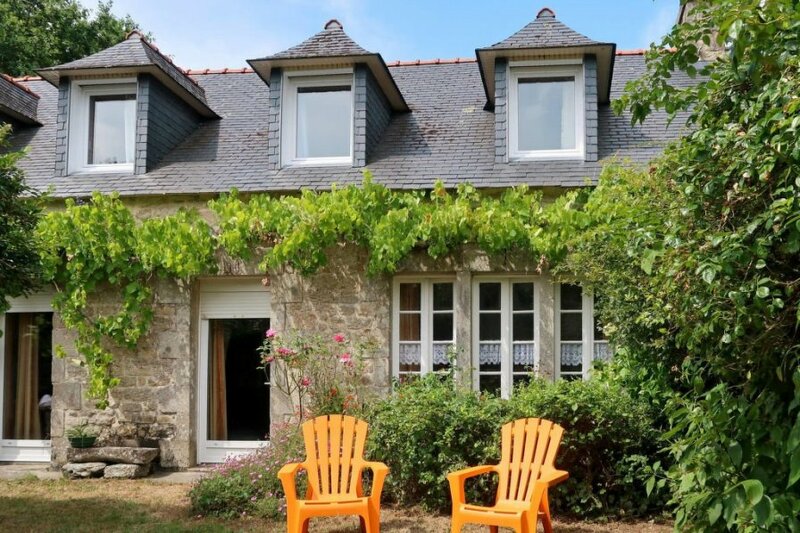 This 5 bedroom house is located in Pont-l'Abbé and sleeps 8 people. The house is near a beach. Semi-detached house, 8 people, 6 room/s, 5 bedroom/s, 2 bathroom/s, approximately 160 m², 2 floor/s. Feature: Property on an estate (6 units in total). Furnishing: local standard, rustic, individual, tiled floor, parquet floor. Equipment: DVD; washing machine; electric radiators (on request); storage room (external access only). € 8 per person and stay (depending on occupancy) plus Holiday resort tax. Linen/towels Bed linen available (beds are ready-made upon arrival). Towels must be brought along. Towels available on loan, € 5 per person/​stay (on order). Deposit € 300 (in cash). Cot/​High chair free of charge (on order). Pet 1 pet allowed, € 25 per stay (please advise prior to arrival; additional animals on request only). Situation: in the hamlet Pen Am Prat, dead-end street. Access/parking: cart track, approximately 400 m.
Estate (shared use): approximately 15 ha, open plot, meadow, fields. Plot description: private part of the estate approximately 300 m², open plot, meadow. Reserved open space, furnishing provided, 2 sun loungers, transportable barbecue. The agent describes this house as a family friendly holiday rental ideal for the summer holidays. It is also good value for money. This house is located in Pont-l'Abbé. The nearest airport is only 23km away. It is set in a good location, 6km away from a beach and 5.5km away from the city center. There is a trail for hiking nearby. The house is suitable for activity holidays during the summer as well as family friendly summer holidays. It is also suitable for elderly guests.